Earlier also we have notified that Nokia is working on its own AI, and here is the same came forward. 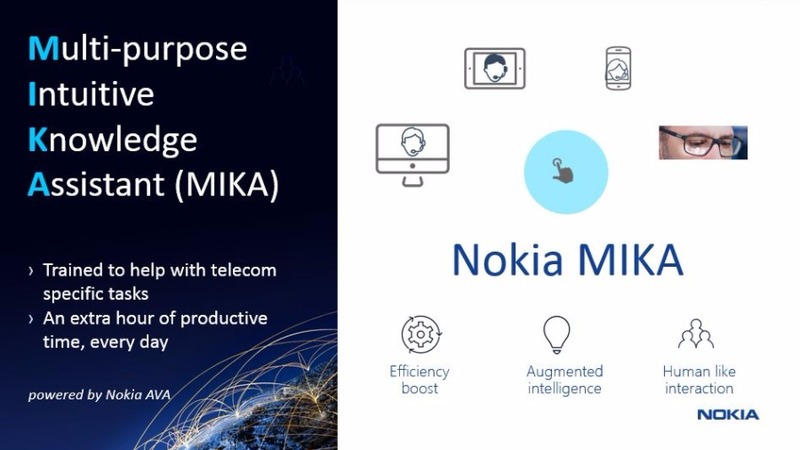 Finnish firm, Nokia have introduced a voice activated digital assistant called MIKA (Multi-Purpose Intuitive Knowledge Assistant). But this AI is little different from what we have seen like SIRI, Google Now etc. Instead of being a commercial voice assistant for everyday users to make online bookings and play music, MIKA will be used by engineers and operators in the telecom sector. It will help them access information using voice commands reducing their focus on less important things. Nokia says that their digital assistant MIKA can save around an hour of productive time in a day. The company is prepared to demonstrate their ambitious digital assistant tech at the Mobile World Congress 2017. MIKA is accessable on web and mobile too, that suggest the network problem solutions by verifying the categories of the issue level. After announcing its first Android based smartphone Nokia 6, now firm is preparing for a great come back into the market.